Evergreen Organix might seem like any other kitchen, shelves filled with baked goods like cookies, cereal treats, brownies, chocolates and fruit chews. 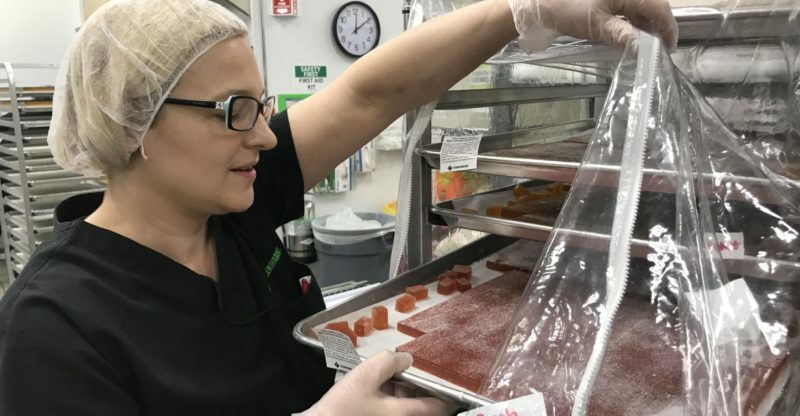 But there’s one key ingredient that sets this kitchen apart: pounds and pounds of marijuana waiting to be infused into the products. With cannabis use legal in multiple states, many businesses are figuring out how to corner their piece of the market. For some companies like Evergreen Organix, that niche is the edibles industry. Since the company started in 2015, it has been experimenting with edible products for both medical and recreational users. Making marijuana-infused treats without the plant’s strong flavor a science. “You don’t want to bite into something and have it taste like marijuana,” Nelson said. Not only did the company have to figure out how to properly dose a product so the cannabis is distributed equally, they had to make it enjoyable. Evergreen’s team come from a variety of backgrounds, from folks with years of laboratory experience to bakers and chocolatiers who have cooked with renowned chefs or at high-end Las Vegas hotels. Nelson said the company has learned what does and doesn’t work through experimentation. Kitchen supplies at Evergreen Organix. Photo by Michael Lyle. The company even has dedicated staff chocolatiers to make infused chocolates. “The craft is essentially the same as any other chocolate-making process, however it takes a bit longer and we are more mindful of our fat ratios,” Nelson said. Three years ago, Evergreen Organix was producing standard fare like chocolate chip cookies and brownies. Five cannabis products quickly jumped to 70, expanding to include baked goods, fruit chews and vape flavors as well as cannabis butter and coconut oil (a vegan-friendly option). While the company has their staples, such as the ever-popular brownie, Nelson said they also make seasonal treats like pumpkin cookies in the fall. Sometimes, a product that makes sense on paper doesn’t become a high seller. 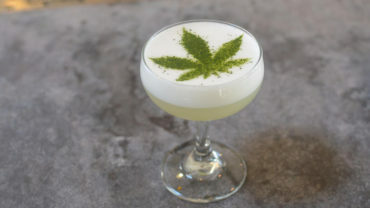 “We tried a cannabis-infused syrup that we thought would be a hit,” Nelson said. Before going to market with a new product, companies must clear legal hoops with the state. Edibles produced at Evergreen Organix. Photo by Michael Lyle. She said the department gets about 15 requests per month. Armen Yemenidjian, founder of Essence Cannabis Dispensary, said edibles are among the most requested items. He predicts the cannabis market will lean even further toward these products. “I foresee non-flower sales surpassing flower sales in the next 18 months,” he said. Nearly all cannabis-infused products take the form of sweets and treats. Nelson said Evergreen Organix wants to look at experimenting with savory items like cheese crackers. Yemenidjian said his dispensary stocks infused barbecue sauces and jerkies, but they are not top sellers.